Sika deer are our most common non-native deer species and originated from North eastern Asia (Japan). There are six subspecies of Sika deer with the Japanese Sika deer the common subspecies present in Ireland, there is also evidence of Manchurian Sika in the North West of Ireland. One stag and three hinds were the original breeding stock for all Sika deer in Ireland. These were introduced by Lord Powerscourt in 1860. A few years later some Sika deer from Powerscourt were moved to enclosed parks in Fermanagh, Kerry, Limerick, Down and Monaghan. However, our present wild deer herds mostly originated as escapees from these parks in the early 20th century during the Troubles (Irish Civil War). Sika deer can interbreed with Red deer. Lord Powerscourt, on his Estate in Co. Wicklow, kept sika and red deer enclosed together, ‘forcing’ their interbreeding. The union produces fertile offspring which may share predominantly one of its parent’s external features intermixed with the other, resulting in ‘red-like hybrids’ and a ‘sika-like hybrids’. The main herds of wild Sika deer are concentrated in Kerry, Wicklow, Tyrone and Fermanagh with some establishing herds in Dublin, Kildare, Carlow, Cork and Donegal. 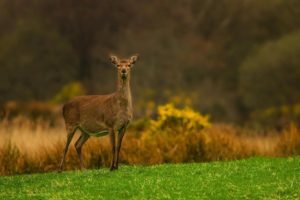 In more recent times Sika deer have been found in Waterford, Galway, Limerick, and Wexford, most likely as a result of illegal introductions or deer farm escapees. 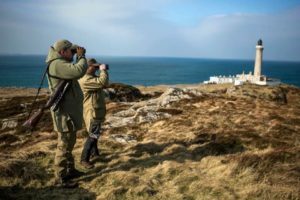 While some claims have been made, the number of Sika and their hybrids in Ireland are unknown as no national deer census have been carried out. Sika/ Red hybrids are most common in Wicklow (where pure sika still occurs too) but examples have also been found in Carlow, Dublin and Cork, the latter poses a threat to our native Red deer found in Co Kerry. It is easiest to see Sika deer when they are actively grazing, mainly at dawn or dusk. Sika are extremely shy and one should take great care to approach carefully from downwind. Sika have a preference for acidic soils and will quickly establish in young pine plantation. They are opportunistic and will colonise a variety of woodland habitats with grazing. The antlers of the stag are branched and can have up to four points on each, in rare circumstances up to five points on each antler have been documented. The rump has an almost concealed white patch with white surrounding hair. When alarmed the white rump patch is magnified and exposed, which is distinctively heart shaped. Coat coloration gets progressively lighter from the ridge of the back to the underbelly. The lighter browns, with creamy white spotsof the summer coat changes to grey browns and almost black in Winter months. Sika are our smallest deer with stags up to 80cm at the shoulder and weighting 50-65kg. Adult females (hinds) are less than 70cm tall and weight 35-45kg. 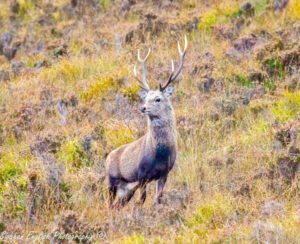 Sika deer are primarily grazers but will eat herbs, heather, young tree shoots and farmed root crops as the opportunity presents itself. The mainly feed in the morning and late evening. Group size in Sika is usually up to ten animals, consisting of females, follower offspring and non breeding males. Stags on the other hand only join the herds during the rut. Antler development in stags usually reaches it’s potential in 7-8 year olds. However at full maturity antler development is more dependant on nutrition and health than age. They will shed antlers in spring and growth starts immediately. A skin covering called velvet covers the antlers while growing and is scrapped off to reveal hard antlers before September. Like Red deer, Sika have pointed or spike like antlers, unlike the palmate of Fallow. Day light controls the timing of the rut which is in mid-late September to early October. Stags can be heard either clashing antlers or emitting a ‘whistle’ which sounds high pitched at the start and ends in a low-pitched moan. Sika stags will be subdued into submission by being pushed backwards – the loser will flip its tail upwards. Mating areas or stands are marked by a facial scent, along with the stag’s urine. This is a territorial signal to other stags to keep away. Territorial rutting areas are the norm in establishing herds. However, in developing populations lone stags tend to move to seek out hinds and then gather them together. Hinds can conceive at one and a half years of age, though it is common at two and half years of age when skeletal growth and muscle mass has attained about 90% of its final size. In the absence of conception, the hinds will repeatedly ovulate at 21 day cycles until pregnancy is achieved. Pregnancy lasts over 7 months and calves are born in late May and early June with weaning usually occurring during the Spring. Sika deer and our native Red Deer are of the same genus Cervus, and they can interbreed to produce fertile hybrid offspring. Hybridisation is a major concern in preserving the genetic purity of both Red and Sika deer. There is a disagreement as to whether interbreeding only occurs in captive (penned or park) mixed herds. Interbreeding in the wild is certainly rare. But after hybrids escape from penned/emparked herds, certainly hybridisation is easier with pure red and sika deer. 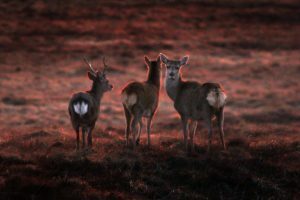 Many believe that the Red and Sika herds of Killarney are still genetically pure, however most Sika-like deer in Leinster have some ‘Red’ blood. Extensive genetic testing of the Killarney red and sika deer has not indicated the presence of hybrid deer to date. 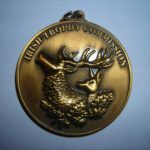 Whereas almost 250 individual tissue samples supplied by hunters were subjected to genetic testing and of the deer tested across the county of Wicklow the presence of hybrid (red and sika) and pure Japanese sika was revealed. 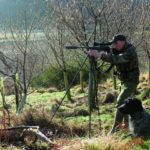 Sika are protected under the Wildlife Act 1976 and may be hunted under a section 29 licence granted by the National Parks and Wildlife Service. 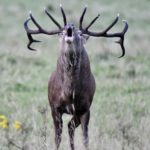 Stags may be hunted from September 1st to December 31st and Hinds from November 1st to February 28th, between the hours of, 1 hour before official sunrise and 1 hour after sunset. It is illegal to hunt deer at night or with the use of dogs. Smith SL, Carden RF, Coad B, Birkitt T, Pemberton JM (2014). A survey of the hybridisation status of Cervus deer species on the island of Ireland. Conservation Genetics 15: 823-835. Carden RF, Carlin CM, Marnell F, McElholm D, Hetherington J, Gammell MP (2011). Distribution and range expansion of deer in Ireland. Mammal Review 41: 313-325. McDevitt AD, Edwards CJ, O’Toole P, O’Sullivan P, O’Reilly C, Carden RF (2009). Genetic structure of, and hybridisation between, red (Cervus elaphus) and sika (Cervus nippon) deer in Ireland. Mammalian Biology 74: 263-273.